Online networks have the highest potential for change since they create a new modular system of education that facilitates customization. The traditional decision making process in schools is centralized and not effective - in this system change and customization are nearly impossible. Each school should have one person - and eventually an organization - whose sole job it is to implement online courses. This person needs autonomy and the freedom to bring in online courses and help students access the classes they need. Invest in platforms that allow students, parents and teachers to create tutorials for each other. We learn most deeply when we teach others. Teacher training should include instruction in building tools for different types of learners and distributing them through user networks as these will be the key to making learning student-centric. Struggling students can be helped through user networks to locate a tutor or find suitable content online. The key to all these can be summed up in 2 main words: online and networks. I'm interested to see more international schools investigating online education. Over 10 years ago when I was visiting a school in Peru I noticed some of the older students doing online courses. I was told these were courses that the school did not offer, yet it provided the access, time and structure for students who wanted to do them. My new school has an active online academy for students, parents, teachers and in fact anyone in the world who wishes to participate, and offers courses as diverse as yoga, photography and foresic science as well as many digital literacy courses. In fact I'm participating in 3 of these courses before I actually arrive there. I think the potential for transforming education through online networks is huge, and I'm really excited that I'll soon be involved in this trend and will be pushing my learning in new directions. I agree with your views about online education, but I worry about how it can be used with all of our students. 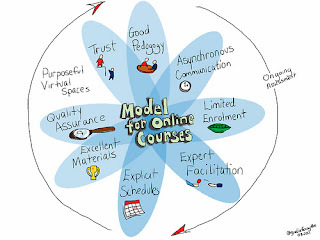 Online learning takes a large amount of self-motivation and self-regulation. In its current state I'm concerned that we would end up disengaging the majority of our students. In its current form in many ways you are correct, but a key attribute of any disruptive innovation is that it improves to handle more complicated problems. Online learning--in blended learning settings in particular--promises to be able to be actually far more intrinsically motivating for each student in the future if we continue to drive it to personalize for each child and fashion a truly student-centric world. A big opportunity and big questions ahead as well.